When providing some functionality for processing a file uploaded by the user, the file must be available to the process throughout the execution. A simple upload and save operation presents no issues. However, if in addition the file must be manipulated before being saved, and the application is running on several servers behind a load balancer, then we need to make sure that the file is available to whichever server is running the process at each time. For instance, a multi-step “Upload your user avatar” functionality may require the user to upload an avatar on step 1, crop it on step 2, and finally save it on step 3. After the file is uploaded to a server on step 1, the file must be available to whichever server handles the request for steps 2 and 3, which may or may not be the same one for step 1. A naive approach would be to copy the uploaded file on step 1 to all other servers, so the file would be available on all of them. However, this approach is not just extremely complex but also unfeasible: for instance, if the site runs on hundreds of servers, from several regions, then it cannot be accomplished. A possible solution is to enable “sticky sessions” on the load balancer, which will always assign the same server for a given session. Then, steps 1, 2 and 3 will be handled by the same server, and the file uploaded to this server on step 1 will still be there for steps 2 and 3. However, sticky sessions are not fully reliable: If in between steps 1 and 2 that server crashed, then the load balancer will have to assign a different server, disrupting the functionality and the user experience. Likewise, always assigning the same server for a session may, under special circumstances, lead to slower response times from an overburdened server. A more proper solution is to keep a copy of the file on a repository accessible to all servers. Then, after the file is uploaded to the server on step 1, this server will upload it to the repository (or, alternatively, the file could be uploaded to the repository directly from the client, bypassing the server); the server handling step 2 will download the file from the repository, manipulate it, and upload it there again; and finally the server handling step 3 will download it from the repository and save it. In this article, I will describe this latter solution, based on a WordPress application storing files on Amazon Web Services (AWS) Simple Storage Service (S3) (a cloud object storage solution to store and retrieve data), operating through the AWS SDK. Note 1: For a simple functionality such as cropping avatars, another solution would be to completely bypass the server, and implement it directly in the cloud through Lambda functions. But since this article is about connecting an application running on the server with AWS S3, we don’t consider this solution. 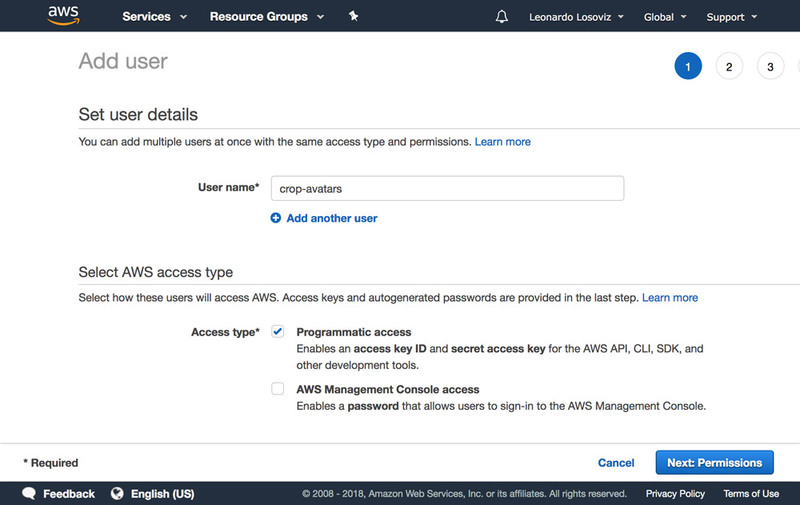 Note 2: In order to use AWS S3 (or any other of the AWS services) we will need to have a user account. Amazon offers a free tier here for 1 year, which is good enough for experimenting with their services. 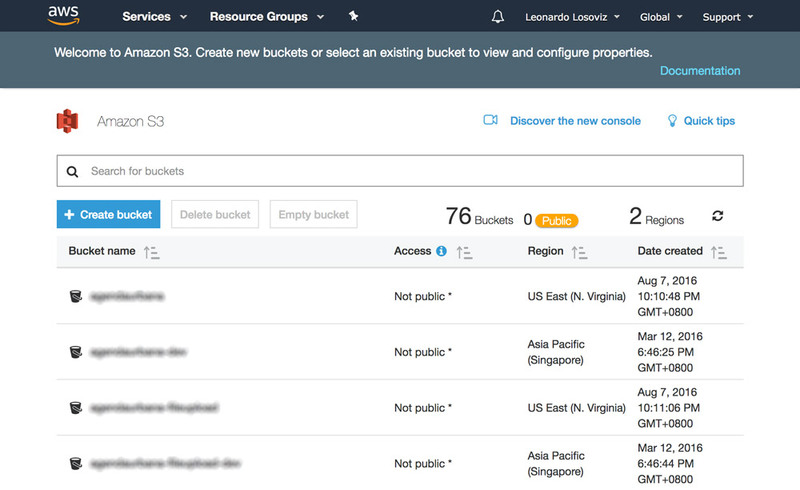 When creating the bucket, we need to pay consideration to the bucket name: Each bucket name must be globally unique on the AWS network, so even though we would like to call our bucket something simple like “avatars”, that name may already be taken, then we may choose something more distinctive like “avatars-name-of-my-company”. The region must be the same one as where our application is deployed, so that accessing S3 during the process execution is fast. Otherwise, the user may have to wait extra seconds from uploading/downloading an image to/from a distant location. 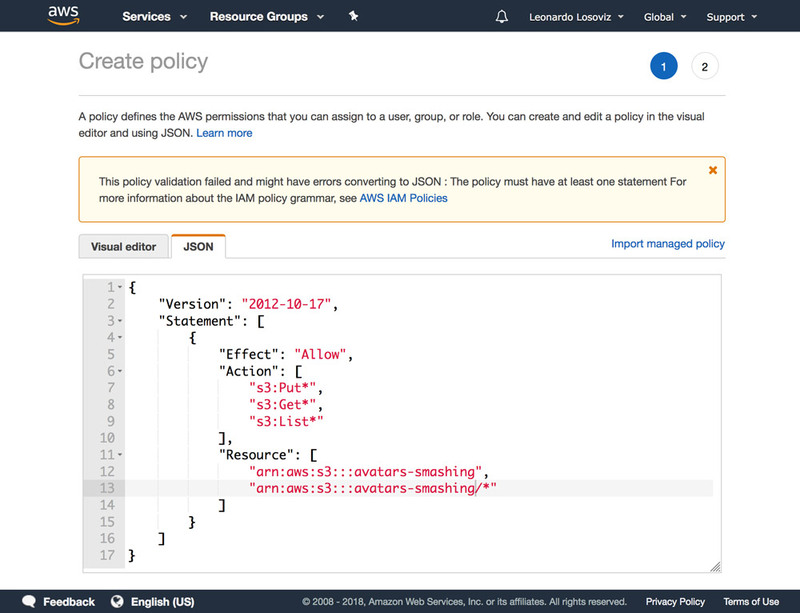 Note: It makes sense to use S3 as the cloud object storage solution only if we also use Amazon’s service for virtual servers on the cloud, EC2, for running the application. If instead, we rely on some other company for hosting the application, such as Microsoft Azure or DigitalOcean, then we should also use their cloud object storage services. Otherwise, our site will suffer an overhead from data traveling among different companies’ networks. Only the bucket name and region are mandatory. For the following steps we can keep the default options, so we click on “Next” until finally clicking on “Create bucket”, and with that, we will have the bucket created. 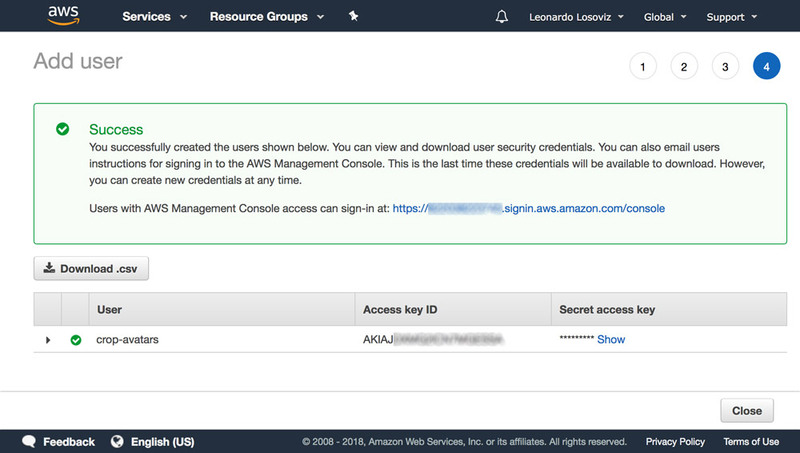 When connecting to AWS through the SDK, we will be required to enter our user credentials (a pair of access key ID and secret access key), to validate that we have access to the requested services and objects. User permissions can be very general (an “admin” role can do everything) or very granular, just granting permission to the specific operations needed and nothing else. The SDK is available through a myriad of languages. For a WordPress application, we require the SDK for PHP which can be downloaded from here, and instructions on how to install it are here. Once we have the bucket created, the user credentials ready, and the SDK installed, we can start uploading files to S3. 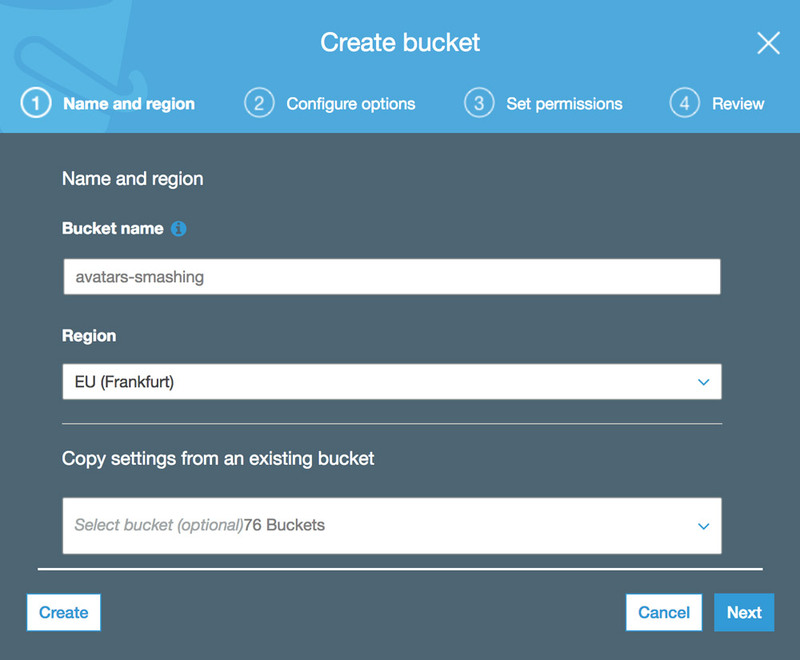 define ('AWS_REGION', 'eu-central-1'); // Region where the bucket is located. This is the region id for "EU (Frankfurt)"
In our case, we are implementing the crop avatar functionality, for which avatars will be stored on the “avatars-smashing” bucket. However, in our application we may have several other buckets for other functionalities, requiring to execute the same operations of uploading, downloading and listing files. Hence, we implement the common methods on an abstract class AWS_S3, and we obtain the inputs, such as the bucket name defined through function get_bucket, in the implementing child classes. If we want to display the intermediate state of the file after manipulation on step 2 (e.g. the user avatar after cropped), then we must reference the file directly from S3; the URL couldn’t point to the file on the server since, once again, we don’t know which server will handle that request. Below, we add function get_file_url($file) which obtains the URL for that file in S3. If using this function, please make sure that the ACL of the uploaded files is “public-read”, or otherwise it won’t be accessible to the user. // Check that Key is a full file path and not just a "directory"
In this article, we explored how to employ a cloud object storage solution to act as a common repository to store files for an application deployed on multiple servers. 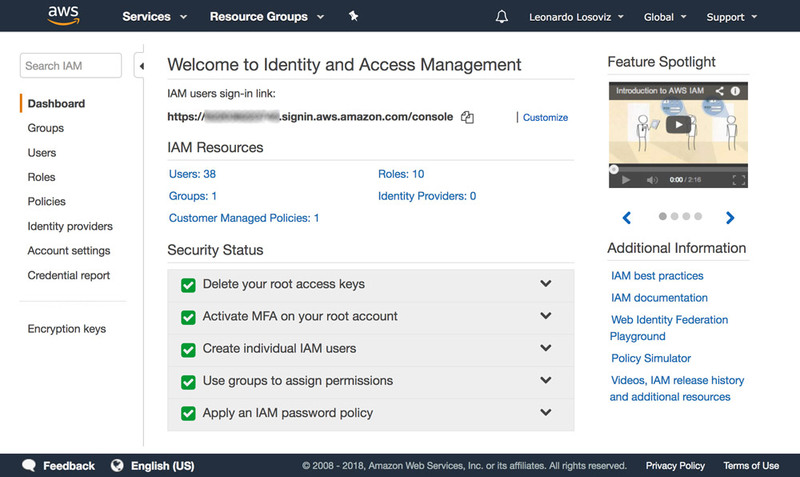 For the solution, we focused on AWS S3, and proceeded to show the steps needed to be integrated into the application: creating the bucket, setting-up the user permissions, and downloading and installing the SDK. Finally, we explained how to avoid security pitfalls in the application, and saw code examples demonstrating how to perform the most basic operations on S3: uploading, downloading and listing files, which barely required a few lines of code each. The simplicity of the solution shows that integrating cloud services into the application is not difficult, and it can also be accomplished by developers who are not much experienced with the cloud.